Twelve big issues each year bring you profitable money-making ideas you can use anywhere, anytime. 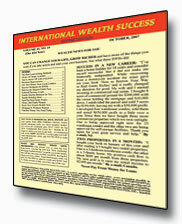 Here are a few of the ways the IWS Newsletter helps you on your path to great riches. As a subscriber you can run one classified ad FREE every month in the print and online versions of the IWS Newsletter. Send us your classified ad by e-mail or fax when you subscribe. We’ll run it FREE in the first issue with space available.